If you read yesterday, you may remember that I was worried that I may have overloaded myself, then the day turned out wonderfully. Well, today I thought I had everything under control and the end of the class was here in the blink of an eye. The day is a blur. It seemed to go by at warp speed. We did a lot, but my head didn't stop spinning until about 4:00. 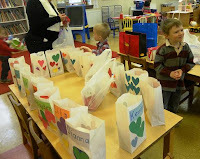 The first order of the day was for the children to deliver their Valentine's to their friends. 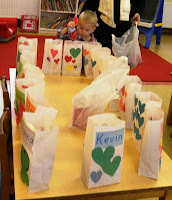 We had actually made the same bags the Pre-K class did, only the children traced their names. Mrs. T helped them to deliver their cards, along with a volunteer grand mom we had today. 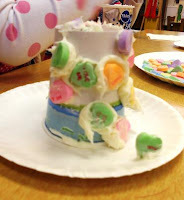 This activity ate up a big chunk of time for Mrs. T.
I had also set out items needed for the children to make Valentine trees. Mrs. T was going to overlook the children at this table while I made the parent's cards. Well, she couldn't get to the table and everyone wanted to do the activity so I started the children here. They all loved doing this although I'm not sure if it was too much sugar at the beginning of the day. I didn't let them eat the "trees," they took them home, but of course they all had to taste. 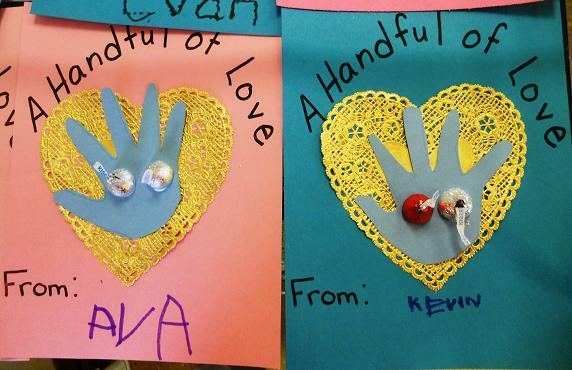 I then started the Valentine cards for parents with the children. 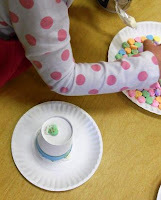 This activity doesn't take too long and it's so cute. 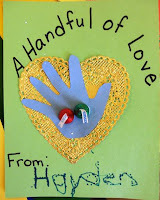 The children love giving the cards to their parents. Snack seemed to take extra long today, maybe that's where I got behind. The leader had brought in individual bags of popcorn and Valentine cookies for everyone. They really seemed to be enjoying their snacks. I ended the day by playing our Friendship game and letting the children check out the Valentine's from all their friends. They seemed to have had a nice day, it just seemed to go by so quickly for me.